I’m all for public art. All the discussion, culture, and revenue it brings to the city are good. It’s exactly what a world class city like New York, New York needs to have, and NYC does it well. Now with the NYC Waterfalls and previously a few years back with The Gates New York has shone and proved that it’s got the vision, connections, ability, follow through and most of all money to turn an abstract concept that pertains to public space and its use into a concrete and enjoyable diversion. My only question is could the money allocated for these public projects be used in a more thoughtful, more useful for more people kind of a way? 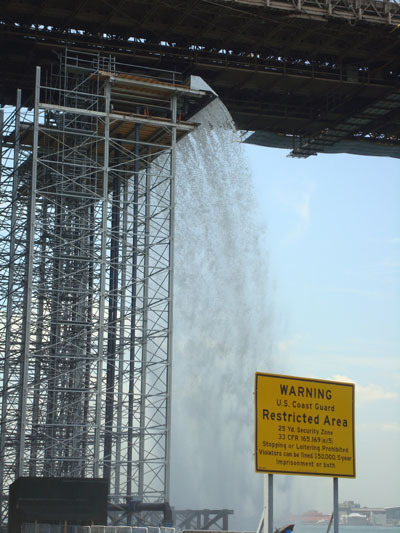 The Gates was estimated to cost $21 million, the NYC Waterfalls cost between $9-11 million to be erected. I understand that a lot if not most of the funds for these projects came from Mayor Bloomberg’s Public Art Machine, a private foundation for such endeavors. Couldn’t Mayor Bloomberg or the city set up a money raising machine to help the NYC homeless population, or help the MTA with what seems to be it’s eternal lack of funds. A fund to fix roads, for public housing, school lunches,the list is endless? 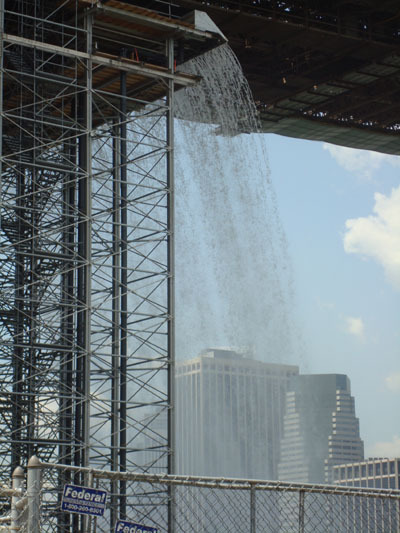 I also understand the fact that the expected revenue from tourists to the NYC Waterfall project is $55 million, and that the Gates had over 16 million visitors during it’s16 day run, making NYC lots of money and just as importantly inspiring people, and I’m not foolish enough to down play the importance of inspiration. But maybe I am naive enough to think that if we, and I mean WE as a society and culture can build multi-million dollar saffron cloth gates in parks, and scaffolding backed cascading waterfalls in a time of credit crunch, housing crisis ,and general economic downturn then WE can do things only cautiously imagined before to help the poor and vulnerable in our society. It’s all about the ROI (Return On Investment). If you can generate enough tax revenue through job placement the money will be there for the program. I empathize with the plight of the Homeless… up to a point, if they just like dropping of the grid, don’t what to work, and are just looking for a handout then, sorry Charlie. You should only get free money if your clinically insane, then you should get disability. Bloomberg is concerned with money making. To make money off of the things you mention is nearly impossible. And millions in tax funds are allocated to programs that deal with some issue you’ve mentioned. You just think their should be more, I guess. Which couldn’t hurt. Andy i agree with you on the whole help those who help themselves bit,I really do. 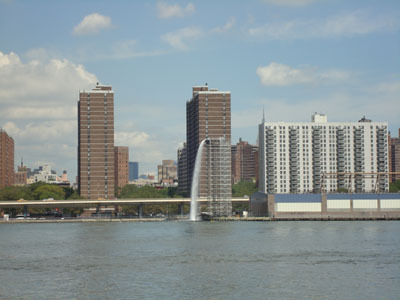 I also think that a few years ago if someone suggested making money from free to view orange cloth ‘gates’ in a park, or man made free to view waterfalls on the East River was a money maker,he or she would not have been taken as seriously as now. That’s my whole point. The public art is an innovative way to do things. I’m definitely not suggesting it be curbed,only that this type of innovation be used to deal with the social ills we as a society have such trouble making better, and leave many of us in a forever ‘less than’ state of being. the waterfall are rad. no doubt out it. Thing is let’s put the same innovative energy into not only public art, but public care. I hear what you’re saying. But these projects are not paid for by the tax payers. Would you be questioning a Van Gogh like this? It’s art, that’s it’s purpose. It is funded privately by people who care about art. Are you proposing we stop spending money on art? Are you with the public school board? Sounds awfully familiar. I have no problem with the art, and you’re right the projects are funded with private monies, though ALSO with supplementary public funds. I don’t question the art or it’s ability to breathe life and inspiration into the city and the people of the city. I only wish that the same innovative tactics used in the public art arena be used in combating social ills and necessities like homelessness and city infrastructure, that is all. A lesson can be taken from the way these art projects have been funded. I would not question Van Gogh if he was not using resources that are sorely needed elsewhere. Art is wonderful and needed in civilization, but so is social welfare for the less fortunate. I know it bleeding heart liberal stuff I’m saying here, but….